Although I had gathered flowers yesterday and placed them in glasses of water to condition overnight, today started out too hectic for me to work with them any further. I never found time to prepare a vase, but the blossoms looked eager and full of promise and it seemed a shame not to share them. So I slipped the glasses onto red wooden trays. Here is a floral design starter kit—flowers and foliage. Just add a vase. This entry was posted in garden and tagged cosmos, flower arranging, flower design, in a vase on monday, nature photography, zinnia on October 19, 2015 by pbmgarden. Why would we need more than this? Glad you see it that way Ricki! These flowers looked so pretty lined up on my counter, but I did feel I should make some attempt at arranging them into a vase. This is a lovely way to show off lots of different flowers – who needs a big flouncy arrangement when you’ve got all these pretty elements to spread around the house! I sometimes just put a few flowers in a glass too, especially the cosmos now that they are finally plentiful! I love the predominant reds and pinks you chose this week. Thanks Cathy! It’s wonderful we’re both getting to enjoy the cosmos at long last. I’d like to try white next year. 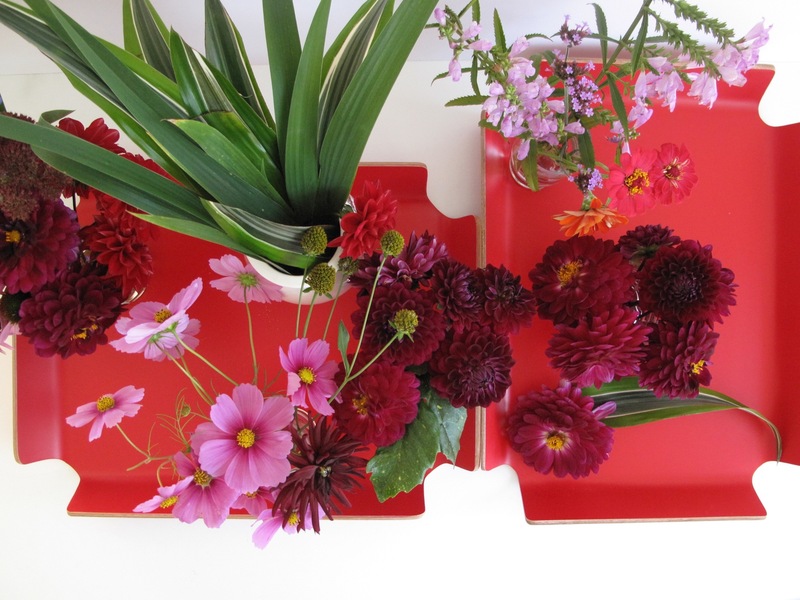 The pinks then reds ranging into burgundy all look fantastic on the red trays, the colors all work so well together, and the dahlias are gorgeous. I like the striped leaves, too, Susie. Thank you Hannah. I’m enjoying the dahlias this fall. Last week someone was trimming and reshaping a Dracaena and was about to throw away those leaves, so I asked if I could have them. I love these colours together too. Dark red and pink always reminds me of the special strawberry teas my mum used to make during high summer when the strawberries were plentiful. This is a very good example of less is more. Sarah, your strawberry tea sounds like a nice treat and nice memory. Lovely! I like those beautiful colours! Thanks Anca. They do brighten up the house. Fun! Love the bright colors. Hope you will give us a peek at the vase too, when you have time to put it together. Thanks Marian. If I get inspired to pull off a vase this week I’ll share it. Such lovely colours. They look lovely just as they are in little vases lined up on the red trays. Thanks. Glad I remembered those red trays today. Helped unify the various containers. Great pictures and perfect blooms…you’ll be enjoying these for days to come. Its lovely to have just something beautiful to look at around the house. Thanks Noelle. It is a treat to have fresh flowers from the garden. We’ve had a light frost so I appreciate every bloom. Great idea, and I like your selection of flowers! Thanks Beth. Fewer things to choose from this time of year, but I’m glad to have discovered dahlias to extend the season. What a good idea – even if it originally was unintentional! And as we have all learned, it just goes to show yet again the pleasures to be gained from a few blooms quickly plonked in a jar or glass. Thanks for taking the time to photograph and write up your post – and hope you enjoyed your busy day! You’re right, the flowers don’t need lots of fussing and arranging to bring pleasure. Thanks Beverly–the garden’s last hurrah before it rests. They do seem to shout happiness. You have a great eye for color and form combinations, Susie, and you always make great use of foliage as an accent. Does Dracaena grow in your garden or do you have it in pots? (I have several Dracaena as indoor plants but it’s never occurred to me to use them.) I would have loved to see you work your magic with these materials. The burgundy dahlias and the Rudbeckia seedpods are wonderful. Kris, thanks for your generous comment. No magic really and never got around to making a vase, but I had just sorted the flowers roughly by stem length and put in water to condition. I have a small indoor Dracaena from a floral design workshop 2 years ago, but these particular leaves were rescued from the gym after yoga class! At the gym there are plants scattered all around the building. A couple of weeks ago a man was reshaping and trimming away old leaves from a large Dracaena and tossing them away. I shamelessly asked him if I could have them. He looked totally shocked but was happy to share them. All but a couple were still in fine shape and still look good. You can manipulate them (roll, fold, cut) or just use as they are in arrangements. Give them a try. 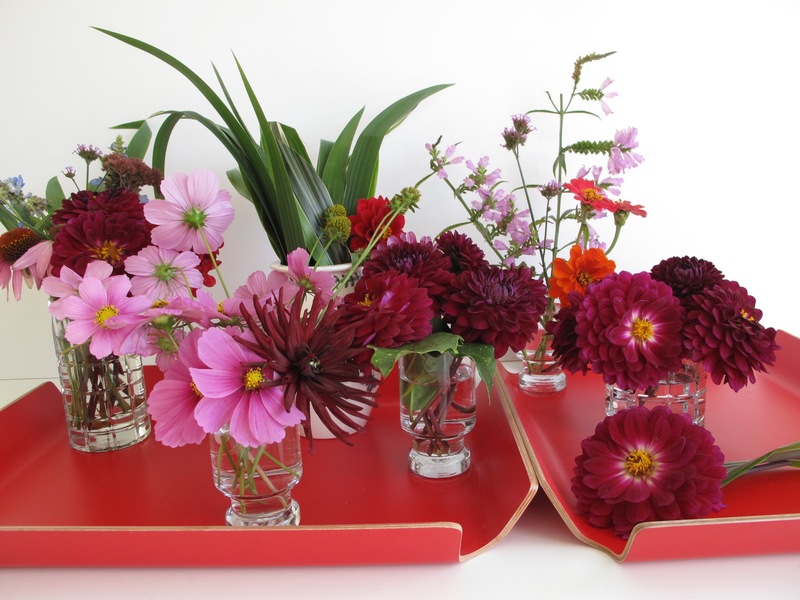 Excellent starter kit – especially the dahlias, zinnias, and iris foliage. Wish I could drop some by your house Donna! Would love to share them. What a happy accident: no further steps required.